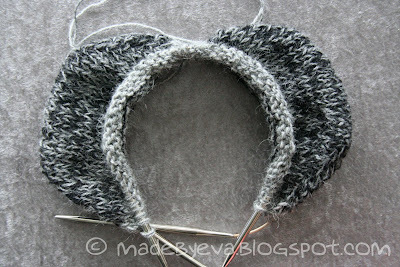 Made by Eva: New on my needles - two slippers at once! No, I'm not knitting a giant bra. ;) Or an old-fashioned-shaped bonnet. This is my first attempt at knitting two slippers at once! I have leftover Alpaca in five shades of gray, and knitting two at once is a way of ensuring that I don't use so much of each colour on the first slipper that I haven't got enough to make the second slipper look the same. Challenge #1: One of the two circular needles needed for knitting this way, is only 40 cm long, so the stitches just barely stay on, and it curls unpredictably when knitting. Challenge #2: I knit each slipper using two strands at once, so I have to keep track of four strands of yarn at all times. Challenge #3: As all my yarn is leftover from previous projects, I only have one skein of each colour, so I have to draw yarn from both the inside and the outside of the skeins at once! Challenge #4 (and this is the kicker): I've never knit two slippers at once, and my only guide to how, is a picture I saw somewhere, ages ago. So I don't really know how!